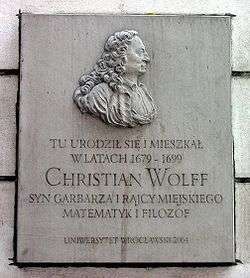 Christian Wolff (less correctly Wolf; also known as Wolfius; ennobled as Christian Freiherr von Wolff; 24 January 1679 – 9 April 1754) was a German philosopher. The mountain Mons Wolff on the Moon is named in his honor. 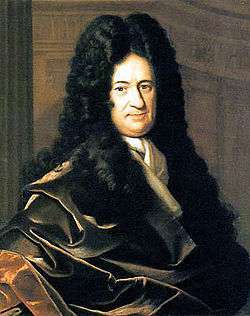 Wolff was the most eminent German philosopher between Leibniz and Kant. His main achievement was a complete oeuvre on almost every scholarly subject of his time, displayed and unfolded according to his demonstrative-deductive, mathematical method, which perhaps represents the peak of Enlightenment rationality in Germany. However, the claims Wolff advanced on behalf of philosophical reason appeared impious to his theological colleagues. Halle was the headquarters of Pietism, which, after a long struggle against Lutheran dogmatism, had itself assumed the characteristics of a new orthodoxy. Wolff's professed ideal was to base theological truths on mathematically certain evidence. Strife with the Pietists broke out openly in 1721, when Wolff, on the occasion of stepping down as pro-rector, delivered an oration "On the Practical Philosophy of the Chinese" (Eng. tr. 1750), in which he praised the purity of the moral precepts of Confucius, pointing to them as an evidence of the power of human reason to reach moral truth by its own efforts. On 12 July 1723 Wolff held a lecture for students and the magistrates at the end of his term as a rector. Wolff compared, based on books by the Belgian missionaries François Noël (1651–1729) and Philippe Couplet, Moses, Christ and Mohammed with Confucius. According to Voltaire professor August Hermann Francke had been teaching in an empty classroom but Wolff attracted with his lectures around 1,000 students from all over. In the following up Wolff was accused by Francke of fatalism and atheism. The Prussian crown prince Frederick defended Wolff against Joachim Lange and ordered the Berlin minister Jean Deschamps, a former pupil of Wolff, to translate Vernünftige Gedanken von Gott, der Welt und der Seele des Menschen, auch allen Dingen überhaupt into French. Frederick proposed to send a copy of Logique ou réflexions sur les forces de l'entendement humain to Voltaire in his first letter to the philosopher from 8 August 1736. In 1737 Wolff's Metafysica was translated into French by Ulrich Friedrich von Suhm. Voltaire got the impression Frederick had translated the book himself. Wolff had philosophy divided into a theoretical and a practical part. Logic, sometimes called philosophia rationalis, forms the introduction or propaedeutics to both. Theoretical philosophy had for its parts ontology or philosophia prima, cosmology, rational psychology, and natural theology; ontology treats of the existent in general, cosmology of the world as a whole, psychology of the soul as a simple non-extended substance, and rational theology of the existence and attributes of God. These are best known to philosophical students by Kant's treatment of them in the Critique of Pure Reason. Practical philosophy is subdivided into ethics, economics and politics. Wolff's moral principle is the realization of human perfection—seen realistically as the kind of perfection the human person actually can achieve in the world in which we live. It is perhaps the combination of Enlightenment optimism and worldly realism that made Wolff so successful and popular as a teacher of future statesmen and business leaders. ↑ What happened in Halle should not be seen as an isolated case, but as trendy and fashionable. Around 1720 Chinese porcelain was loaded in enormous quantities to Europe. In the Albrechtsburg the Meissen porcelain manufactory had been started up to copy it and Chinoiserie was popular among artists and buyers. ↑ His Habilitation thesis title was Philosophia practica universalis, methodo mathematica conscripta (On Universal Practical Philosophy, Composed from the Mathematical Method). ↑ Wolf, C. (1985). Michael Albrecht, ed. Oratio de Sinarum philosophia practica/Rede über die praktische Philosophie der Chinesen. Philosophische Bibliothek (in German). Hamburg, Germany: Felix Meiner Verlag. p. XXXIX. ↑ Lang, Donald F. (1953). "The Sinophilism of Christian Wolf (1679–1754)". Journal of the History of Ideas. University of Pennsylvania Press. 14 (4): 561. JSTOR 2707702. ↑ "Auditorium Maximum der Universität Halle" (in German). Rathausseite. Retrieved 1 January 2012. ↑ Uhalley, Stephen; Xiaoxin Wu (2001). China and Christianity: Burdened Past, Hopeful Future. San Francisco: University of San Francisco Ricci Institute for Chinese-Western Cultural History. p. 160. ISBN 0-7656-0661-5. Retrieved 1 January 2012. ↑ Israel, Jonathan I. (2002). "29". Radical Enlightenment: Philosophy and the Making of Modernity. Oxford University Press. ISBN 0-19-925456-7. ↑ The Sciences of the Soul: The Early Modern Origins of Psychology by Fernando Vidal, p. 92. ↑ Seize the Book, Jail the Author: Johann Lorenz Schmidt and Censorship in ... Door Paul S. Spalding,Johann Lorenz Schmidt, p. 128. ↑ Mac Donogh, G. (1999) Frederick the Great, p. 129. ↑ Mac Donogh, G. (1999) Frederick the Great, p. 134. ↑ How to Consult the I Ching, the Oracle of Change Door Alfred Douglas, p. 82. ↑ Available online on Göttinger Digitalisierungszentrum. This article incorporates text from a publication now in the public domain: Chisholm, Hugh, ed. (1911). "Wolff, Christian". Encyclopædia Britannica. 28 (11th ed.). Cambridge University Press. Hettche, Matt. "Christian Wolff". Stanford Encyclopedia of Philosophy.